Comment: An inspiring book in Spanish about longevity and life joy centered around the concept of ikigai. Comment: A book exploring the concept of deep work, defined as activities in a state of distraction-free concentration that push your cognitive capabilities to their limit. The author claims the ability to perform at that level is becoming rare, and at the same time more valuable. Comment: A productivity book Francesc Pla recommended to me. The book presents three core ideas. Each day, highlight something you are going to deliberately concentrate on. Learn to focus. Then reflect and fine-tune your techniques. Comment: The Bullet Journal passed my radar long time ago, but my first impression was "too complicated and rigid" and I had forgotten about it. That changed when I saw the astonishing notebook of Iván Párraga. I am sold on this framework, and the book is excellent to really understand it, deeper than any video or blog post that you can read. Comment: This is a book about mastering abilities that require practice. Focuses on some psychological aspects like cultivating detachment, getting rid of fears and ego, and on some practical aspects in what I'd call extremely deliberate practice. The book frames its mindset around playing musical instruments, Kenny Warner is a world-class jazz pianist, but I believe its principles apply to many other fields. Comment: This novel takes place in a brand new 40 story luxury high-raise with 1,000 tenants, two swimming pools, school, bank, supermarket, .... Starting with some complaints and first disagreements, life in the building follows a spiral down to chaos. Comment: Hilarious book that made me laugh and nod from cover to cover. This is a keepsake from Santorini, Greece. I purchased it while visiting Oia during holidays, in the unique bookshop Atlantis Books, which is an obligatory stop. Comment: The author is a world-class French mathematician, who among other things was awarded a Fields Medal in 2010. This is a fascinating book I could not put down. It documents his day to day pursuing an open problem that was extremely difficult. Emails with his colleague, sustained hard work, highs and lows, errors, confidence and optimism, inspiration, dispair, clever tricks, dead ends, discarded paths, how the proof takes shape over time.... Of course, I didn't understand the math, but that doesn't matter. Comment: Catalan translation of the thriller The President Is Missing. Comment: Cool book about contemporary zen with a somewhat practical and historical way to look at things. It ends with an appendix in which mindfulness is critizized. Well-documented, this book has been a source of a good number of pointers to follow. Comment: Delightful novel. Originally written in Italian, this is the Catalan translation. There is also an English translation. Title: ¿Qué es comer sano? Comment: This is a book in Spanish about myths or dubious popular wisdom about food. The author has a PhD in Biochemistry and Molecular Biology, Biotechnology professor, researcher, ..., this guy knows what he is talking about. At the same time, the vocabulary and style are very approachable, and there's a nice touch of humor here and there. Comment: This is a book about data-intensive software systems, densely packed with information. Reliabilty, scalability, and maintainability are discussed from different perspectives, such as data structures, distributed platforms, or batch and stream processing. Comment: This is a wonderful and beautifully edited book about watches. It covers a variety of topics, from some historical information, how to purchase, or how to take care of a fine watch, to the technical details about their parts, how they work, complications, etc. Comment: Spanish translation of Barack Obama's memoir Dreams from My Father. I loved this book, it was a present from my wife. Comment: Spanish translation of How to Count to Infinity. A very small book around the concept of infinity. Purchased it thinking in my daughter. I liked the intuitive flavor of the exposition, but at times it gets just a bit technical in a way that seems unbalanced for my taste. The overall impression didn't click, and I have actually not passed it to her. Comment: Ranch is a socket acceptor pool for TCP protocols used by Cowboy, the Erlang/OTP HTTP server. I am reading its documentation as part of groundwork for a talk, as well as personal interest. Comment: Spanish translation of The Stand. This was a Christmas gift. Stephen King says in On Writing: A Memoir of the Craft that this is considered to be his best novel by his fans. I left this book after +300 pages read, did not actually like it. This book criticizes the way mathematics are taught. It is mostly about K-12, but the same criticism is also applicable to the university in my experience. Creativity is not encouraged, lack of exploration and development of intuitions, lack of motivational historical context, excessive emphasis on notation, formalism, and sequences definition-lemma-theorem-corollary for which you have a formal understanding only, without a true and profound grasping. I have a criticism for the book itself, though. The thesis of the author is quickly clear, and then repeated again and again. This essay is only 25 pages long, but could have been way shorter in my view. This book is available as a PDF here. Comment: An extraordinary book on OTP and distributed systems. This is not just a dry listing of APIs or principles, rather, the extensive practical knowledge of the authors in production systems permeates the exposition. The book is comprehensive and very well-written. Comment: Reviewed a draft of this book. Covers several aspects related to the adoption of Elixir in three blocks. The first one is about adopting Elixir in a team or company. Covers team building, people, training, etc. The second block covers several aspects of Elixir development. And the third block is about taking Elixir to production, deployments, benchmarking, etc. Spanish translation of On Writing: A Memoir of the Craft. This book has three parts. In the first one Stephen explains a bunch of scattered memories from his youth, early steps, addictions, love, ..., I believe they kind of build who is he going to be, both as a writer, and as a person. In the second one, the raison d'être of the book, Stephen writes about his craft from different perspectives. The third part is more vital, reflects about an important accident. This summary is 10% shorter than the first one. Comment: The authors of this book are long-time meditators and scientists. They have studied meditators of different traditions and levels of expertise for a long time, and summarize here their most important findings. Comment: Another keepsake from New York, also purchased at McNally Jackson Books, 52 Prince St. This book is not really a biography of Coltrane as such, but more of a story of his sound and evolution as musician. Comment: Keepsake from New York, purchased at McNally Jackson Books, 52 Prince St. Comment: Catalan translation of the Pulitzer-awarded novel To Kill A Mockingbird. Comment: I am really enjoying this book. Master Lluís Nansen studied theoretical physics and I believe that is reflected in the way topics are addressed. The text has clarity, and the style is straightforward. This book is the Catalan edition, there is a Spanish edition as well, but no English translation as of this writing. Comment: I devoured Córrer o morir, so I purchased this second book by Kilian Jornet right away. I am reading the Catalan edition, there is no English translation by now. Comment: Original Catalan version of this book by superhuman Kilian Jornet (who is Catalan). This is among the most authentic and inspiring books I have read, totally recommended. There is an English translation titled Run or Die. Comment: Father's Day present of this year. This is a Spanish translation of An Invitation to Practice Zen. Comment: Going through the official Elixir docs, and leveraging the pass to contribute some patches since I am on it. Comment: Trying Audible with this one. Comment: This book is an introduction to Algebra and Galois Theory based on its historical geometric roots. An exposition with motivations and context for the abstractions, which are normally ignored in modern dry presentations. Comment: I am solving the exercises of this book, check them out in this repo. Comment: Spanish translation of Fooling Houdini. Fascinating book about the underground world of magicians. Comment: Extraordinarily well-written account of Wright Brothers' life, written by Pulitzer Prize winner David McCullough. I purchased this book in the airport of Philadelphia, while waiting for my connection to Barcelona coming back from RailsConf. Comment: This is a book with short essays written by Oliver Sacks knowing he was about to die due to some metastasis found in his body. In it, Oliver Sacks reflects about life. I purchased this book in the airport of Chicago while waiting for my conneciton to Kansas City for RailsConf. Comment: Catalan translation of Seven Brief Lessons on Physics. Comment: This is very down-to-earth book about Zen. It is presented as a series of questions (by Susan), answered by Norman. The book covers a really broad set of topics. Norman Fischer is a Sōtō Zen roshi, former abbot of the San Francisco Zen Center among other things. Purchased this book in Ottawa, while visiting Shopify. Comment: Spanish translation of The Life-Changing Magic of Tidying Up: The Japanese Art of Decluttering and Organizing. I got this one after seen it referenced online as something potentially life-changing, but would not recommend it. You could summarize this book in a tweet: "Throw stuff". Comment: Biography of the legendary tenor saxophone Dexter Gordon. 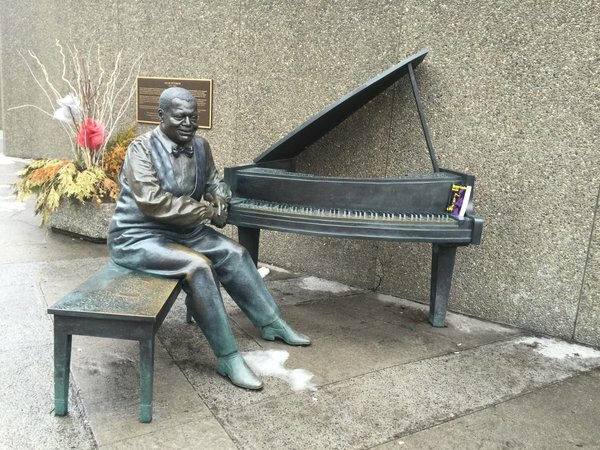 I finished this book during a trip to Ottawa and dropped it in the sculpture homage to Oscar Peterson. You can see it in this photo, to the right of the piano. Comment: Second pass, reviewing the final draft of this book. Phoenix is going to be really big. Reading this book makes me very happy, I personally appreciate José a lot and remember his first steps with Elixir. The success of Elixir is inexorable! Comment: This is the PhD thesis behind JRuby+Truffle, a Ruby implementation based on the Truffle AST interpreter framework and the Graal dynamic compiler for the JVM. The performance of JRuby+Truffle is spectacular, I think it could be an inflection point in the history of Ruby. Comment: Autobiography of a physician who did scientific research on alternative medicines for many years at the University of Exeter. His work often got controversy, hostility, and personal issues coming from alternative medicine advocates. Comment: This month I visited San Francisco for the first time to attend the Google Summer of Code 2015 Mentors Summit at the Google headquarters. I leveraged the occasion to visit the San Francisco Zen Center, founded by master Suzuki. The temple was not open at that moment but they very kindly showed it to me, and I could do zazen (I am a Soto zen practitioner). They have a small bookstore where I bought this book. Comment: Spanish translation of The Martian. Comment: Second time I read this book. Comment: Spanish translation of Sit Like a Buda. Comment: Spanish translation of the Japanese classic. Translated to English as The Book of Five Rings. Comment: Instant purchase after @sd's recommendation. The premise of the story is really interesting, but didn't finish it because it is a novel written in American English, which was hard to follow at a normal pace for me due to its idiomatic vocabulary, slang, ignorance of American context, culture, etc. Comment: Spanish translation of The Math Book. Comment: This book talks about financial independence through frugality: hack your life to need a ridiculously small amount of money per month, and invest for a few years to be able to cover that amount. Comment: Catalan translation of Victus: The Fall of Barcelona, a Novel (originally written in Spanish). This is a historical novel about the fall of Barcelona after its siege in the Spanish Succession War in 1714. Probably the single most important event in the history of Catalonia. This summer, the Spanish goverment via its embassy censored the presentation of the translation to Dutch in Utrech. That created a Streisand effect, and I decided to buy the novel as a way to protest. Enjoying the protest indeed, the novel is well-written, having a great time. Author: Jeffry S. Life, M.D., Ph.D. Comment: Solid book. A doctor that is specialized in age management explains key stuff to fix ourselves and stay healthy as we age. Everything is backed up by research or professional knowledge of our body. He has tested all he preaches on himself, and has seen the plan at work on his patients. Comment: Refreshing theory to complement my saxophone classes. Comment: A book about the Navy SEALs: how they train, how's their life, war stories, what does it take. Written by a veteran SEAL who was the Honorman of class 45 (1969), and Commander with SEAL Team One in Vietnam. Comment: A book about the stoic philosophy of life. It matches a lot the way I see life since my 20s, but didn't know it had a name. DHH recommended this book in Twitter. Comment: Well-researched book that explains why calories math or eating less, exercising more are not effective methods of weight control. The text refers to a lot of research lab studies its remarks are founded on, and based on all that known, proved science, develops a five week plan to fix hormonal clog and lower your set-point in a sustainable way. Comment: I have been working remotely since 2006. This book is full of common sense and matches my personal experience. Title: Are Your Lights on? Comment: Catalan translation of The 100-Year-Old Man Who Climbed Out the Window and Disappeared. A present from this year's Diada de Sant Jordi. Author: James H. Austin, M.D. Comment: This is a unique tome. The author is a scholar, a neurologist, who happens to have been practicing zen for about thirty years. This large work merges his scientific knowledge of the brain with his zazen experience. Comment: Spanish translation of Unmasking Buddhism. The book strips away some existing preconceptions about Buddhism. Comment: The most advanced book about Rails in the market. Reading a draft of the new edition. Comment: Spanish translation of Night Over Water, linked above. Comment: I started to play the alto saxophone last October. This is an extraordinaire book which covers playing the instrument in depth. Teaching style is profound. It covers a solid explanation of the techniques, how and why you build a strong foundation, together with a more transversal message about reflecting, consciously observing yourself, and in general taking an active approach to improve your playing. Awesome book. Comment: Spanish translation of Paul Newman's biography by Shawn Levy, linked above. Paul Newman was an extraordinaire man. Comment: Amazing book about Ruby internals soon to be published. I am proofreading a draft. Comment: I am reading the Spanish translation. Comment: This is the first book by Taisen Deshimaru, a Zen master who brought Soto Zen to Europe. He founded the dojo where I did zazen in Barcelona. Comment: Autobiography of General Chuck Yeager. Legendary test pilot, WWII flying ace, first man who broke the sound barrier. Comment: Spanish translation of The Corner, linked above. A nonfiction book about West Baltimore written as a novel that spawned the HBO series of the same title, and later The Wire. I read about 1/3 of the book, but once the day to day of the corner had been depicted I wasn't hooked enough to have other 400 pages of the same thing. Comment: Spanish translation of The Right Stuff, linked above. Fascinating research story about test pilots engaged in U.S. postwar experiments with rocket-powered, high-speed aircraft, and the Mercury project. Comment: Simple, authentic, unpretentious, a little jewel. Comment: This book is not published yet. I am reading a practically final draft Nick (@njr) kindly gave me. I am the author of the Perl interface to Fluidinfo, and was involved in the project for some weeks in 2009. It has an enormous potential to become a world-wide database of everything. Comment: I am getting into flight simulation these days. X-Plane 10 has been the first simulation I've tried. Also got FSX. Comment: Catalan translation of Everything's Eventual: 14 Dark Tales, linked above. Comment: Hardcover edition, Catalan translation. Comment: Excellent book about Rails best practices and refactorings to fix common AntiPatterns. A must read for any beginner/intermediate Rails developer. Comment: Catalan translation of Murakami's acclaimed novel 海辺のカフカ, translated to English as Kafka on the Shore. Comment: Spanish translation of What I Talk About When I Talk About Running. Fantastic book about... I don't know, it is supposed to be about running and writing novels, and it certainly covers those topics, but there's more in it, about life, endurance, little things, being oneself. I devoured it in two sittings. Comment: Spanish translation of Buddhism for Dummies. Introduction to Buddhism using a clear language, its basis, history, practices, branches, etc. Comment: Arcadi Alibés is a known Catalan journalist who has done more than 100 marathons all over the world as an amateur runner. This book, written in Catalan, explains his experience. A really nice story that breaths simplicity, humbleness, and love for this sport. Recommended. Comment: Somehow lost this book. I was doing the exercises, check their GitHub repo. Comment: This book is a gem. It is a formal and rigorous math book, but it is full on drawings and intuitions that explain why things behave the way they do. You think math non-linearly using intuitions, symbolic manipulation and orderly exposition comes after that. IMHO the approach in this book should be the norm for books and classes. Comment: Test::Unit user over here, but worth reading about anyway. Comment: The source code of TeX. A masterpiece of literate programming. Comment: Catalan translation of The Last Lecture. This is a wonderful book about life. Go read it. Comment: Really insightful. Recommended if you're into software development no matter your expertise level. Comment: Very clear introduction to Git. I read its online version in my iPad. Comment: I learned Ruby on Rails with the first edition of this book. Still the best introduction in the market in my view. Good coverage, good pace, good exposition, superb editorial quality, with an extensive test suite that explains its overall correctness. Comment: Spanish translation of He's Leaving Home. Comment: Really insteresting book with quite a lot of information about what modern neuroscience knows about brain health. With some incursions into shamanic practices I don't care about, buy anyway worth reading. Comment: Spanish translation of Sumiko Kudo's Gateless Barrier: Zen Comments on the Mumonkan. Comment: And introduction to the stock market in Spain, not very to the point though. Comment: I read a draft of José's book. Superb, the most advanced Rails book in the market. Comment: Spanish translation of A Mathematician Plays the Stock Market. Comment: Marketed as Secret of the Seventh Son in USA, linked above. Comment: A second edition of this book is due by October 2011, will wait for that one. Comment: Second time I read this little jewel. Comment: This book covers only the basics, but the Head First series is interesting in itself. Didn't read the +700 pages though. Comment: A book by 37signals, full of a common-sense that is not so common. Comment: I've been wearing Vibram FiveFingers for months now and am gonna give running a whirl, inspired by Born to Run. Comment: Really fascinating, no matter whether you run or not (I don't). There's something fundamental in it, about running, authenticity, endurance, about we as human beings.... Totally recommended. Comment: This book has not been yet published, I reviewed some chapters of it. Comment: Spanish translation of Senza sangue, also translated to English as Without Blood, linked above. Comment: Bought in Barnes & Noble in Baltimore, during RailsConf 2010. Read like half of it, too much talk. Comment: Insightful and reflective about you and your career. Full of wisdom. This was the first book I read in the iPad. Comment: Spanish translation of Peace, linked above. Comment: Spanish translation of afterzen: Experiences of a Zen Student Out on His Ear, linked above. A perspective of Janwillem's Zen experience, 40 years after he went to Tokyo as related in The Empty Mirror. Comment: Spanish translation of The Empty Mirror: Experiences in a Japanese Zen Monastery, linked above. This guy went to Japan to study in a monastery of the Rinzai school and explains his experience in a very honest way. Comment: Spanish translation of Infinite Jest. I lost it in a bus, hope to retake it someday. Comment: A must-read, full of experience, balance, and reflection. Comment: Short but very good overview of zen: practice, terminology, history, art, philosophy. In Catalan. Comment: Seth Goding deeply understands modern leadership. Comment: I read the first edition of AWDwR back in 2005. Still a must for any Rails developer. Comment: I liked The Tipping Point, but this one is unconvincing for me. Comment: I first read this intro circa 1995, nice little book. Comment: I received this book in PDF format as a gift from a user of my Rails plugin model_auto_completer. I am proud to read it to use for the first time my brand new shiny iRex DR 1000S ebook reader. Comment: A revealing book. Must read. There's a short summary in the Wikipedia. (Check the "Criticism" section as well.) And another longer one at Wiki Summaries. Comment: Catalan translation of The Pillars of the Earth, linked above. I liked it a lot but some work interrumpts prevented me from following the story, parked until the right time comes. Comment: I got the idea of the language, but the book itself didn't hook me enough to finish it. Comment: Spanish translation of The Road. Comment: This book is outstanding, Rails has now two must-reads. Comment: The first time I rode a Segway I knew I would buy one as soon as I could afford it (I did). I was really intrigued about the story behind such an extraordinarie invention, it promised genius and transpiration. This book explains it, thank you guys for documenting and sharing this. Comment: My friend jao lent me this thought-provoking book, thank you dude! Author: Jared Richardson, William Gwaltney Jr. Comment: Roger Casaponsa lent me this book, I had a great time thank you dude! Comment: First book (of three) of the Spanish translation of Cryptonomicon. It hasn't hooked me. Comment: Too dense and conceptual for what I wanted. Comment: Spanish translation of Migraine, I wrote a summary. Comment: I wrote a summary. Comment: I didn't like the style. Declarative sentences in present tense.